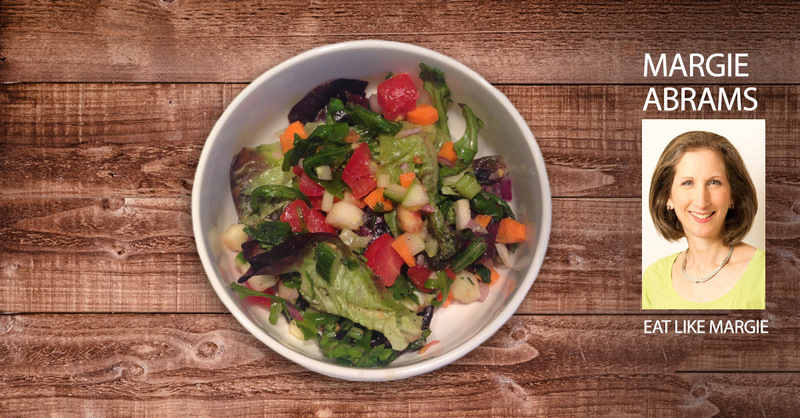 Spring is here and, with it, salad season! My husband loves making salad (it’s actually always salad season in our house). For him, the chopping is more of an active meditation than a chore—relaxing and restorative. You can always tell who made the salad by the size of the veggies—his are fine and mine are hefty. This is Bob’s go-to salad. Practically every week, he makes up a giant batch and then we enjoy it for days. The ingredients are driven as much by texture and color as they are by taste. I always say that ugly food is the most delicious (as you can see by my food photographs! ), but vegetable salads are certainly an exception to that rule. This is as beautiful to behold as it is to eat. The essential ingredients are lettuce, tomato, onion and apple. If you’re not that into crunch, leave out the celery and carrots. If there’s some other veggie you like, the more the merrier! The simple dressing indeed dresses up the taste of whatever produce it adorns. I will often take leftovers for lunch and just add some protein to the top. That might be garbanzo beans…or canned (BPA-free!) wild salmon…or leftover chicken…or smoked salmon that I crisp in a nonstick-ceramic frying pan (it tastes like bacon but none of that unhealthy fat or preservatives!). As with any salad…wash and chop! It’s particularly critical to wash the greens—even if it you buy them “prewashed.” Prewashed greens are a common cause of food poisoning. We can’t buy non-prewashed arugula in our supermarkets. I prefer buying butterleaf and romaine in heads rather than bagged or boxed, but Bob prefers the prewashed even if we do rewash it. It’s still faster than having to cut AND wash a fresh head of lettuce. You don’t have to peel carrots—the skin is nutrient-rich and delicious. Do wash well with a vegetable brush whether or not you plan to peel them. Regarding chopping technique…as I said above, Bob chops everything pretty finely. I go for speed so the pieces are closer to bite-sized. But I do like to slice the lettuce into thin shreds rather than break it into pieces. It’s much easier to eat that way. 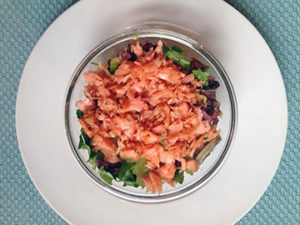 The dressing here is almost exactly the same as what I put on my Zesty Red Beet Salad. (I add onion powder to that and you could do it here, too.) Once all of the vegetables are chopped, drizzle with olive oil (organic, extra-virgin olive oil preferred)…then squeeze out the juice of the lemon…and sprinkle with salt and pepper to taste. If you want to get a bit fancier, zest the lemon before you squeeze it to add an extra-special touch of color and taste. On occasion, we don’t eat the salad as quickly as expected. 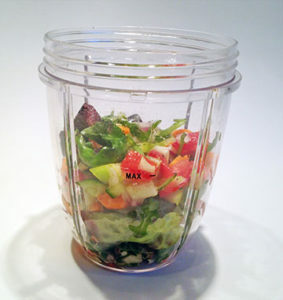 When I just can’t eat anymore salad but don’t want to let it go to waste, I add water and whir it in my smoothie maker for a homemade V-8. You can also turn a dying salad into soup. Just add broth, boil and puree with an immersion blender.